With the brutal winter of 2014 almost behind us, many folks are eagerly looking forward to Spring Break on the Alabama Gulf Coast. It’s great to spend your spring vacation relaxing on the sugar white sand, but Gulf Shores and Orange Beach also offer many family activities for when you’re not playing in the surf. Not surprisingly, go-karts are the main attraction at The Track. The more adventurous members of you family will probably head for the Wild Woody, a three-story spiraling wooden track. However, The Track also has a classic go-kart track with single and double-seated karts so that everyone in the family can participate. There are even special tracks for drivers as young as 5-years-old (Kiddie and Rookie Karts). After a few circles around the track, check out the River Boat Miniature Golf course and Kid’s Country with rides, a Ferris wheel and carousels for pint-sized patrons. The older kids may want to head over to the Sky Coaster, a free-fall experience from up to 110 feet at speeds of 70 mph. The Track uses a carnival-type ticket system for all rides and attractions. Tickets can be purchased online beforehand for a 10 percent discount. The Track— Family Recreation Center, 3200 Gulf Shores Pkwy. You could spend an hour or a full day at the Wharf where there are plenty of shops, restaurants and attractions to keep you and the kids occupied. Marking the grand entrance to the Wharf is the southeast’s tallest Ferris Wheel. You can get a great overview of Orange Beach from the top of the wheel, which is over 112-feet tall. The Ferris Wheel just happens to be located next to the Carmike Wharf 15, which shows all the latest movie releases. Or if you are in the mood to do something a little more active, check out Arena the Next Level, where kids of all ages can play Laser Tag or Bazooka Ball. The Wharf, 4830 Main Street, Orange Beach. Adventure Island is built around a five-story volcano that erupts regularly with fire, sound and vibrations. There are plenty of other main attractions at Adventure Island. You’ll find rides and games for the entire family including go-karts, paddle-boats, two 18-hole miniature golf courses, bumper boats, laser tag, a rock-climbing wall and an arcade. Adventure Island also features several rides for the smaller set, and the Alligator Alley Arcade has more than 100 video and redemption games. Adventure Island, located in the heart of Orange Beach across the street from Seaside Beach & Racquet. Open 9:30 a.m. – midnight. Hours vary during the off-season. Featuring more than 65 of the most popular games on the market, you can find everything from skee ball and basketball free throws to Guitar Hero, racing games, interactive games, kids games and lots more at Fat Daddy’s Arcade. Many of the featured games award tickets that can be redeemed for prizes. Fat Daddy’s Arcade is open daily at 10 a.m. Off-season hours may vary. Located in the heart of Orange Beach next to Bubba’s Seafood on Perdido Beach Blvd. year at Gulf State Park. The Hummingbird Ziplines, consisting of seven towers and six ziplines as high as 90 feet off the ground, offers a high flying adventure for the entire family. The mile-long course takes two hours to complete while offering spectacular views of the gator pond and Lake Shelby. 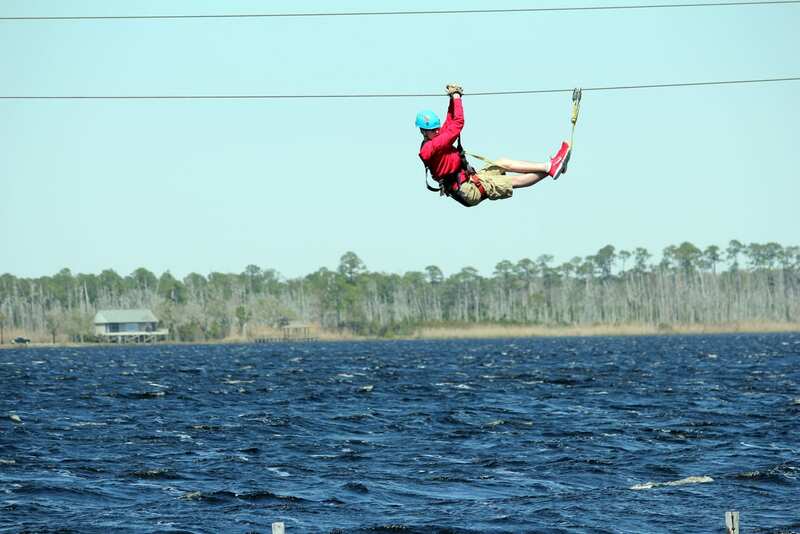 Hummingbird Ziplines, a zipline tour costs $79 for adults and $59 for children 12 and under. Discounts may apply for groups larger than 12. The Alabama Gulf Coast Zoo is an interactive zoo with more than 500 exotic animals and a petting zoo. In spring and summer, you can even play with the babies—including tigers, kangaroos and lemurs. Alabama Gulf Coast Zoo, 1204 Gulf Shores Pkwy. Admission is $10 for adults, $8 for seniors, $7 for children ages 3-12 and free for children 2 and under. Leave us a comment to let us know what family activities you and your family enjoy most on your Spring Break vacations!